Train route coverage in Tangail is very well reached. Why? Coz all the trains come from Dhaka to the northern and southern part of Bangladesh cross Tangail. 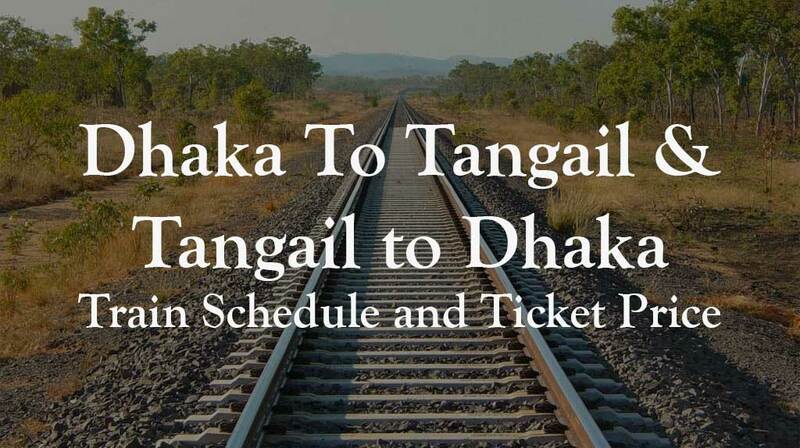 However, In this post, we are going to cover Dhaka to Tangail train schedule, ticket price and Tangali to Dhaka train schedule and ticket price as well. Tangail is the largest district in Dhaka division, Bangladesh but in terms of population, it is second. Once it was the part of Greater Mymensingh district but now it is a separate district and very important as well in perspective of road and rail communication both. The half of population of Bangladesh from Rajshahi and Rongpur division use Tangail as a transit to reach the capital of Bangladesh. So can you imagine how important Tangail district is? It seems that the trains run from Dhaka to Khulna or Dhaka to Rajshahi or Dhaka to Rongpur that most have a stoppage in Tangail so feel free to see the schedule to Komlapur Railway station when the trains are leaving for Khulna, Rajshahi and Rangpur division. For your kind information, I am attaching here Tangail to Dhaka Train schedule. Dhaka to Tangail Shovon Ticket Price 90 BDT. Dhaka to Tangail Shovon Chair Ticket Price 105 BDT. Dhaka to Tangail First Seat Ticket Price 175 BDT. Dhaka to Tangail 1st Birth Ticket Price 140 BDT. Dhaka to Tangail Snigdha Ticket Price 210 BDT. Dhaka to Tangail AC Seat Ticket Price 210 BDT. We already told you that the Tangail is very well connected with the rest of the country. You will be able to travel Tangail from anywhere in the country via train. The ticket price from Dhaka to Tangail is similar like Tangail to Dhaka. Hope this Train schedule helped you. Have a nice journey.